'Barbara's Kiss' ( Eleanor McCown, R. 1981) Seedling #75-15. SPU, 54" (137 cm). Midseason bloom. Standards violet (RHC 1 Opb 4/10) lightly streaked pale yellow; falls strong violet bordering orange yellow signal, veined brownish purple; ruffled. 'Arbitrator' X 'Imperial Beauty'. Cordon Bleu 1982. Honorable Mention 1984. From AIS Bulletin #245 July 1982 Introducing BARBARA'S KISS. 48". A unique color combination with standards of light burgundy mauve and moderate orange-yellow falls, bordered light burgundy mauve. Named in honor of the kissingest lady in Region 15, our two-term Regional Vice President Barbara Serdynski. Arbitrator X Imperial Beauty. $15.00. Cordon Bleu Farms. Interested in Spurias? 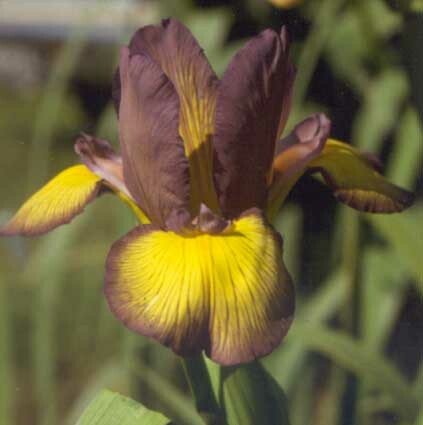 Please visit the: Spurias Iris Society website. JPG DSC_1757.JPG manage 1 MB 04 Sep 2012 - 14:00 Main.andinsky My garden in the San Fernando Valley.